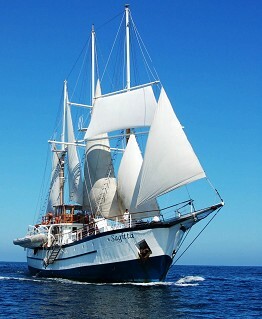 The graceful and spacious three-masted Sagitta is a sturdy steel-hulled ship. Rebuilt for 22 guests and crew, she offers 10 double cabins with one double-lower and one single-upper berth each, plus a larger Owner's Suite with King size bed and refrigerator. 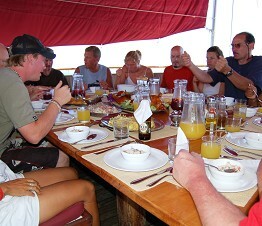 Every cabin is air-conditioned and has its own en-suite bathroom with hot water showers. She boasts a homey salon/bar, a comfortable dining room with large picture windows, a separate library/entertainment center, as well as on-deck dining. 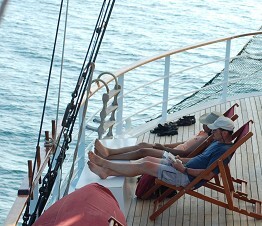 Easy-access, ample deck space with plenty of comfortable seating makes her truly a great vessel for island voyaging.